A healthy and easy dinner, perfect for two. Preheat oven to 400℉. Cut 2 pieces of aluminum foil- about 15 inches in length. Wash and cut off ends of asparagus. Place half of asparagus diagonally in center of piece of foil. 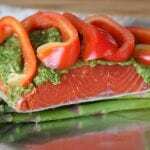 Place 1 salmon fillet on top of asparagus, skin side down. Spread half of pesto on top of fillet. Wash and cut bell pepper into strips, lay over top of pesto. Fold all 4 sides of foil, like a envelope, ending up with a foil pocket. Repeat with second salmon fillet. Place on cookie sheet and bake for 25-28 mins or until veggies are preferred tenderness.